I've been saving up for this post for a while now! 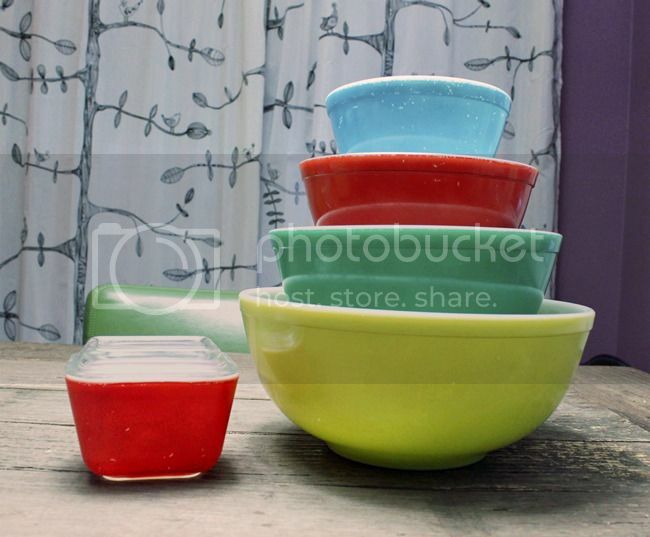 All of us at Betties N Brimstone LOVE Pyrex dishes! We have many pieces in common in our collection, and we like to keep an eye out while thrifting and shopping to help complete eachother's sets. Today I'm showing you what I have in my collection. Hopefully BnB readers will join in on your blogs, and maybe even Lisa and Steph will share their collections soon! Where do we get our Pyrex? Everywhere! Mostly thrift stores and antique malls (if the price is right, or we just need that ONE piece to complete our stack!)... 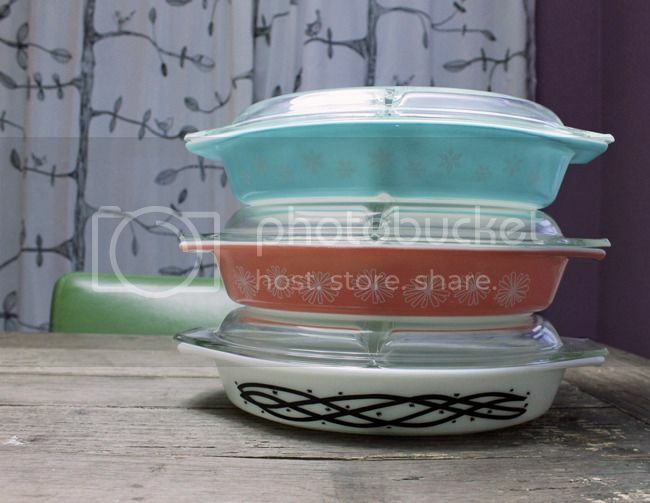 but you can also find good prices online - Etsy, Ebay, and even Instagram are all great places to find Pyrex! Search #pyrex #pyrexia and #pyrexforsale on Instagram to find some great sellers - heck, even Lisa has a sale every so often! Find her at @lisamarie1119. 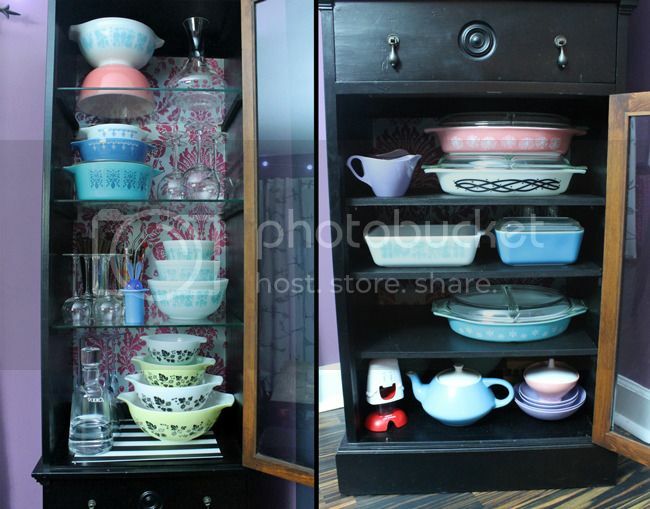 I didn't realize until I was taking photos for this post how much Pyrex I actually have. This cabinet pictured above isn't all of it. This is just the stuff on display. I have a bunch (pictured in the series below) that actively gets used and is kept in my kitchen cupboards. I have plans to one day create more display space via open shelves, but for now a whole lot of it is stored under wraps! I originally showed you this cabinet way back in my dining room post as part of my home tour. In that post (and even in this later update! 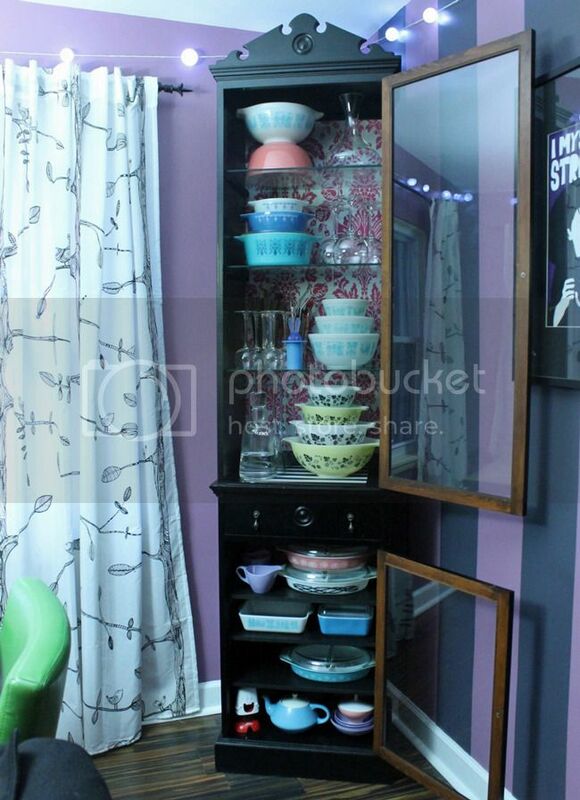 ), I only had glassware and very little in the way of vintage dishes on display. I love how it looks now though, with my favorite pieces stacked and on display! I thought I'd go through my complete stacks first, and then show you some of the mis-matched items and incomplete collections. Here we go! 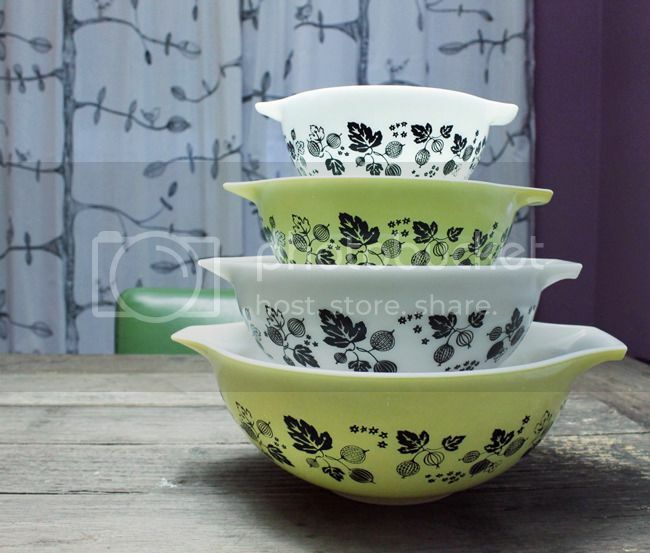 (Above) I found this whole gooseberry yellow cinderella mixing bowl set at a resale shop by my house. All in one! What luck! 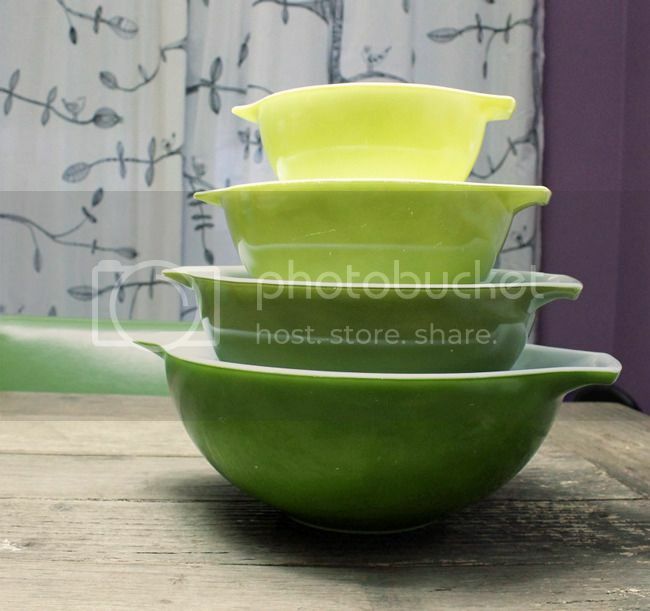 This is a stack of mixing bowls from the verde collection (1960's). Two of the bowls are from Todd's grandmother's house, so I was really excited when my friend Jessy found the two missing sizes for me to complete the stack! My daisy orange-yellow mixing bowl set was completed on accident! 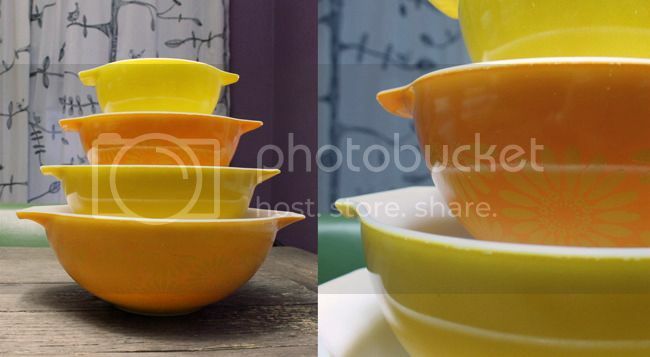 I had purchased the two yellow bowls at a Vintage Garage event. 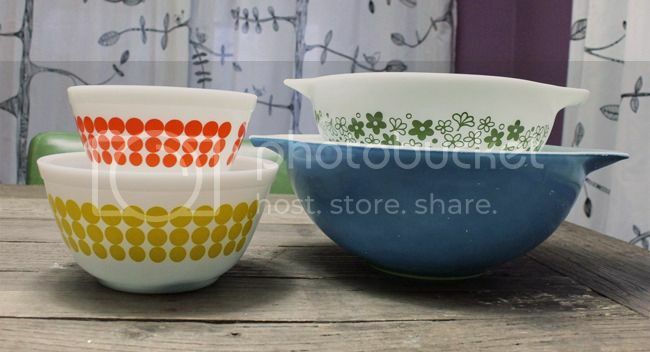 I then found the two daisy bowls at my local thrift store, not even realizing that they were from the same set until I was looking around online! I think this was the first stack that I ever completed. Behold! My most recent accomplishment! I've been wanting a primary mixing bowl set for a long time, and I finally found all of the pieces! The large yellow bowl was Todd's grandmother's bowl, so I was pretty set on NOT buying a whole set - just finding the missing three. It took a while, but I did it! Jessy (again) found me a blue bowl, and the red and green were purchased for a pretty reasonable price at my local antique mall. Another great antique mall find was this super cute tiny red refrigerator dish. I have three divided dishes: a blue snowflake dish (thanks Lisa! ), a pink daisy dish (awesome thrift store find from long long ago), and a black barbed wire pattern from my local antique mall. 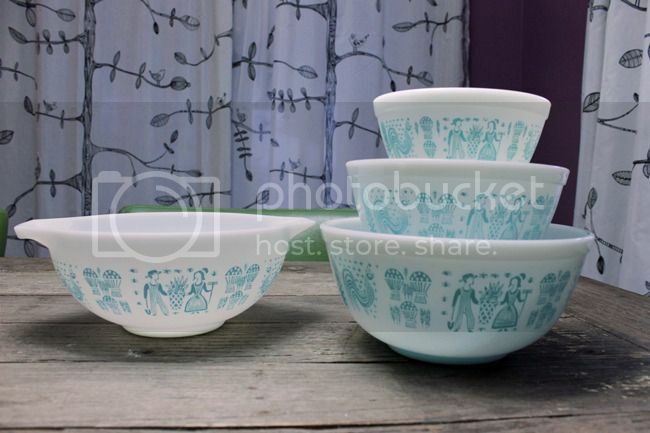 Butterprint is one of my all-time favorite Pyrex patterns. As you can see, I have yet to complete a stack, but I'm close on the mixing bowls! I just need the 404 (largest) size. The cinderella bowls (the ones with the pour spout/handles seem to be more elusive to me. I did locate one of the large refrigerator dishes (sans lid) that you can see a few photos down from here. 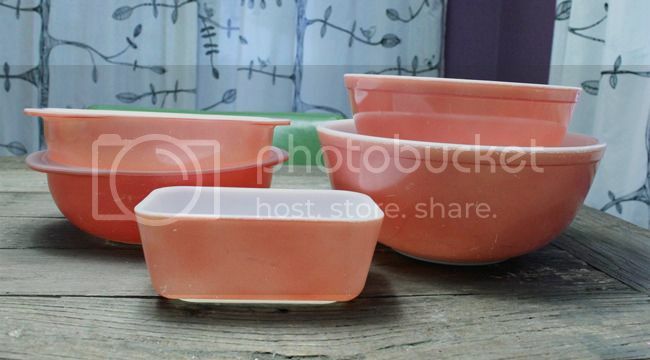 Pink Pyrex is one of my other favorites after turquoise butterprint! Unfortunately, it seems to be way more popular, and therefore harder to find, AND at a reasonable price. The pieces that I have are not in awesome condition, but I'll take it! I have two flamingo pink 2-quart casserole dishes (no lids) - one from Lisa, and one I snagged myself years ago. I have a lid-less refrigerator box via Jessy, and two mixing bowls from Vintage Garage. 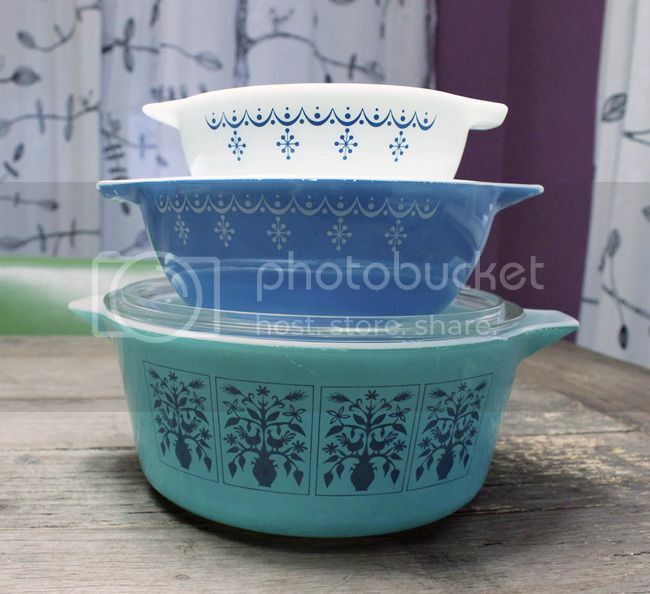 I talked about my butterprint refrigerator dish above, and here's a blue refrigerator dish from the antique mall, which goes with the smaller red refrigerator dish pictured way up above (with the primary set). I have two bowls with the "New Dots" pattern - yellow and orange. I'll be looking out for the two larger bowls, in blue and green dots, to complete this stack, but this is a much more sought-after design and will probably be pretty hard to do. I have just one cinderella bowl with the spring blossom green pattern, and one cinderella bowl from the horizon blue set. How do I know all of this stuff? Internets. 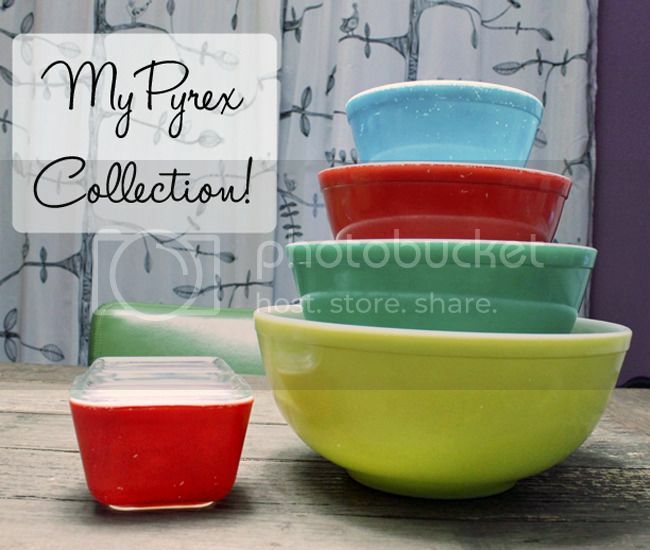 If you haven't noticed, much of my research comes from the site Pyrex Love. My other source for all things Pyrex is Lisa! Hopefully, she'll share her collection with us soon. Throw Your Resolution Out the Window! Come See Me at Grace Street Tavern Tonight!